As a kid, Progresso Minestrone was one of my favorite soups. My mom liked the chicken noodle and tomato soups but I preferred the minestrone for its tomato base, beans, veggies, and little tubetti pastas. Although Progresso is no longer at the top of my list, I do still love minestrone. It's also a great way to use up a bunch of veggies if you happen to have a lot on hand, as I did as a result of our month-long EatWell Farm CSA produce box experiment -- this is definitely the first time I've ever had two large cabbages in my fridge :) I also had leeks, potatoes, celery, carrots, and chard lying around and practically begging to be made into soup. And I happened to have two pieces of Parmesan cheese rind that I'd been holding on to for the past few months for just this purpose. So I got out the big soup pot and cooked up a mess of minestrone. 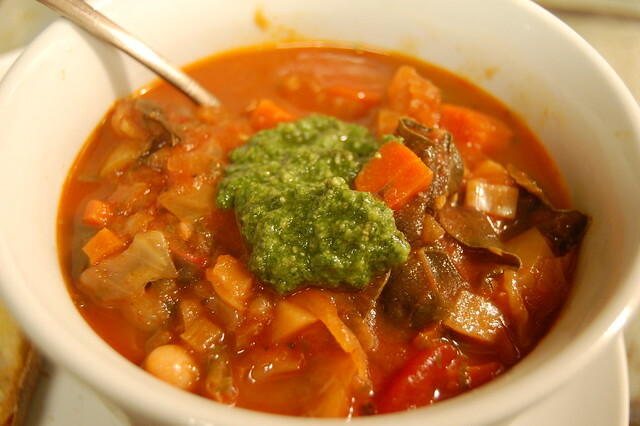 Minestrone is a soup that allows for lots of creativity so you needn't feel hemmed in by this or any other recipe. If you have different veggies, the chances are you can use them and the result will be good. 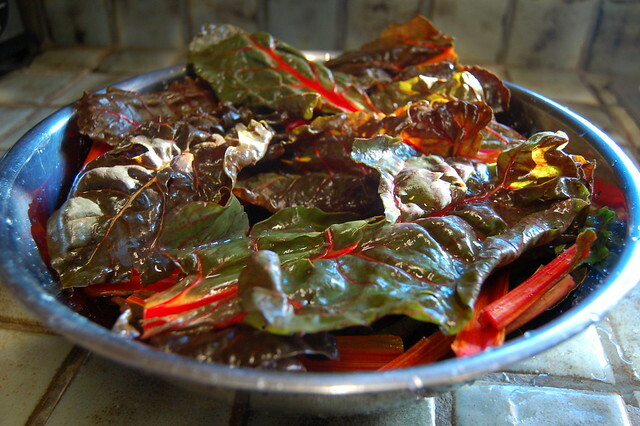 Just be sure to add the veggies in in order of cooking time needed - heartier things like carrots and potatoes before chard leaves, etc. I really recommend adding the fresh pesto. It's very easy and quick to make if you have a food processor of any sort and it gives the soup a delightful zip of flavor that makes me think of summertime. 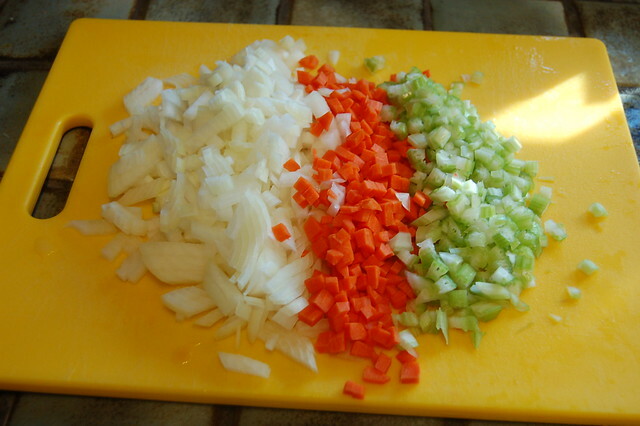 The recipe I used calls for a soffritto, a mix of finely chopped onion, celery and carrot that you saute first to create a flavor base for the soup - you then add more of each vegetable (in bigger pieces) a little later in the cooking process. However, I have also made minestrone without doing an intentional soffritto (I do cook the onion, celery and carrot first but I don't cut them up all tiny and I don't add more later) and the result was delicious so it's really up to you. 1. Make the soffritto: Heat olive oil in a large pot over medium-low heat. 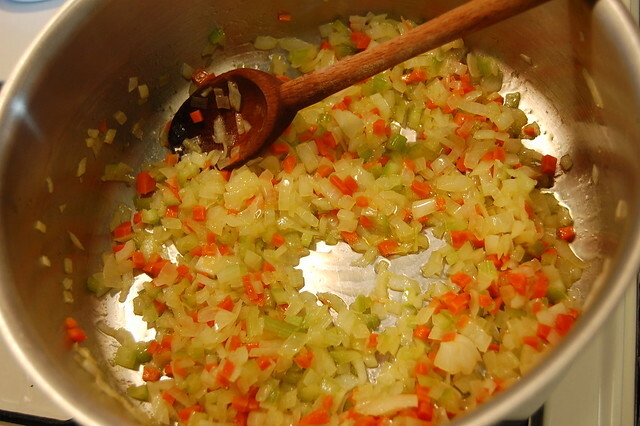 Stirring often, sautee the onions, carrots, celery and bay leaf until the vegetables are soft, about 10-15 minutes. 2. Add the chopped leek and the garlic and cook until soft and fragrant, about 4 minutes. 3. 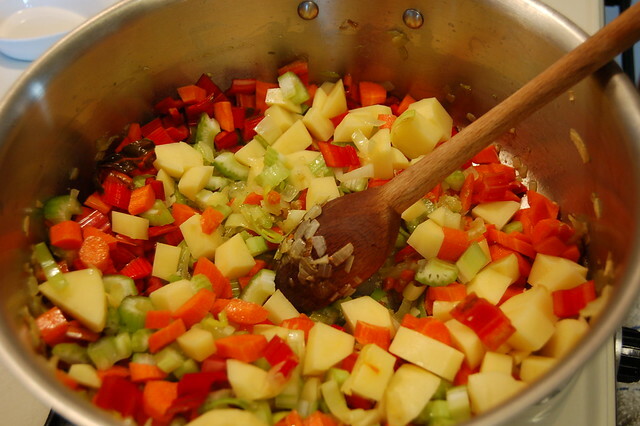 Increase the heat to medium-high and add the chopped celery, carrots, potatoes, green beans, and chard stems. Cook, stirring often, until golden brown, about 5-8 minutes. 4. 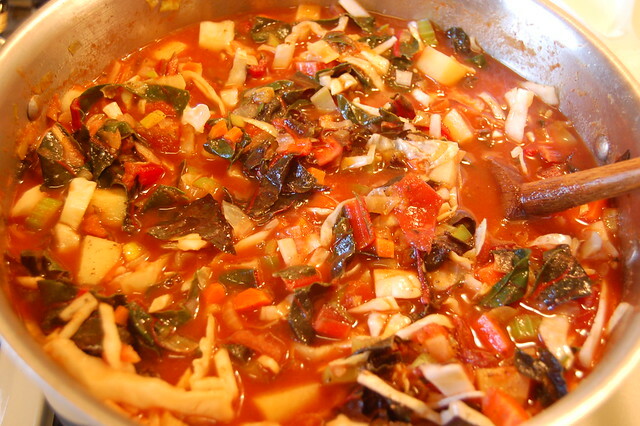 Stir in the tomatoes, chard leaves, cabbage, white wine, stock, cheese rind, parsley, oregano, and red pepper flakes and season with salt and pepper to taste. Bring to a boil, then reduce heat to maintain a steady simmer. 5. Cover and cook for 25-30 minutes or until all vegetables are soft and flavors have blended. About 15 minutes in, add the beans and stir to incorporate. While it's cooking, make the pesto (see below). 6. Remove parmesan rind and bay leaves. Serve hot and top with shredded parmesan and a dollop of fresh basil pesto. 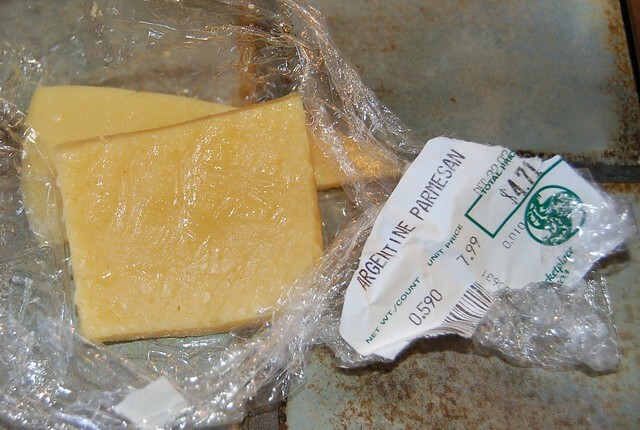 Goes nicely with a loaf of crusty bread and butter or olive oil and a green salad. 1. Place the basil leaves, pine nuts, garlic and cheese in the bowl of a cuisinart or other food processor and add the salt and pepper. 2. Turn the food processor on and add the olive oil in a steady stream. Blend/process until smooth or to desired consistency. 3. Taste the pesto and adjust the salt and pepper as needed. 4. Store in an airtight container in the fridge for up to one week or in the freezer for several months. The top of the pesto will turn brown as it oxidizes but it is still good and if you dig down below the top, the rest should still be that lovely brilliant green. 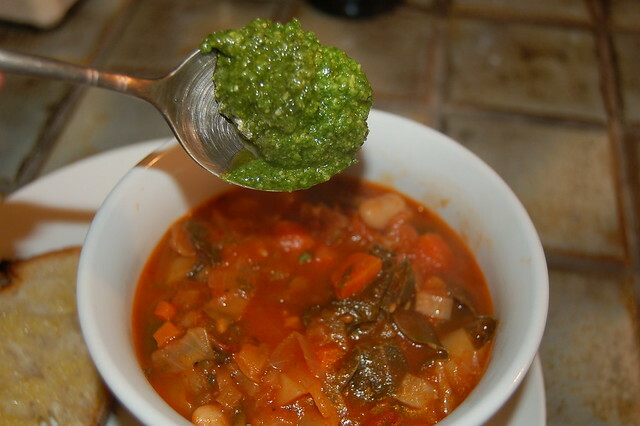 ** Although I'd recommend basil pesto as a topping for this soup, other greens also work well for pesto -- arugala and walnut is a very tasty combination. I also had a delightful cilantro and mint pesto on an asian pasta salad once. So feel free to play around. finally made this after eyeing it for a while. yummy!!! thanks eve!